Teenager Mesaque Dju has arrived in London ahead of his medical at West Ham today, Dju is set to sign a three and a half year contract and will join up directly with the U23's squad. 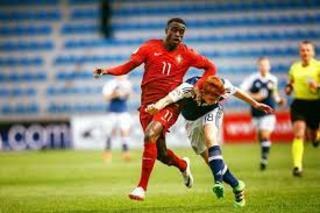 The Guinea-Bissau born player has already represented Portugal at youth level winning more than 50 caps for his country, he was also a team mate of former West Ham player Domingos Quina, both were members of the victorious U19 European Championship winners in 2018. Although West Ham are signing Dju on a free transfer from Benfica, the Portuguese side and the Hammers have come to an arrangement that if Dju is sold on at a later date Benfica will get 50% of any income generated from the sale, which seems a tad generous but he is arriving on a free transfer, Hammers have a further option of extending his deal by a couple more years if he makes the grade. Dju's move is similar to that of Quina and latterly that of Xande Silva, although Dju's preferred position is as a winger he can also play as a centre forward, he has been with Benfica throughout his career but is making the move to England and West Ham due to Hammers perceived nurturing of young talent, what a turn around from the Sam Allardyce days when hardly anyone under 25 was ever given a chance in the first team. So in short we give him half a dozen run outs in the first team, keep him on the books for two seasons and sell him for half the price to Watford? And to add,if he showed that much talent and potential,we would of been at the back of the queue,total waste of time. Cynics.. this kid could be the next modibo maiga!